The University of Edinburgh offers scholarships for distance learning Master’s programmes offered by the University. Note: All applicants will be notified of the outcome in August 2018. The University of Edinburgh was ranked 17th and 21st in the world by the 2014–15 and 2015-16 QS rankings. It is now ranked 19th in the world according to 2016-17 QS Rankings. The Research Excellence Framework, a research ranking used by the UK government to determine future research funding, ranked Edinburgh 4th in the UK for research power, with Computer Science and Informatics ranking 1st in the UK. Scholarships will be available for students commencing in session 2018 any distance learning Masters programme offered by the University. Applicants must be both nationals of the eligible countries (see below). Eligible Regions: Afghanistan, Bangladesh, Benin, Burkina Faso, Burundi, Cambodia, Central African Republic, Chad, Comoros, Congo, Côte d’Ivoire, Eritrea, Ethiopia, Gambia, Ghana, Guinea, Guinea-Bissau, Haiti, India, Kenya, Kiribati, Korea, Kyrgyz Republic, Lao PDR, Liberia, Madagascar, Malawi, Mali, Mauritania, Mongolia, Mozambique, Myanmar, Nepal, Niger, Nigeria, Pakistan, Papua New Guinea, Rwanda, São Tomé and Principe, Senegal, Sierra Leone, Solomon Islands, Somalia, South Sudan, Sudan, Tajikistan, Tanzania, Timor-Leste, Togo, Tuvalu, Uganda, Uzbekistan, Vanuatu, Vietnam, Yemen, Zambia, Zimbabwe. 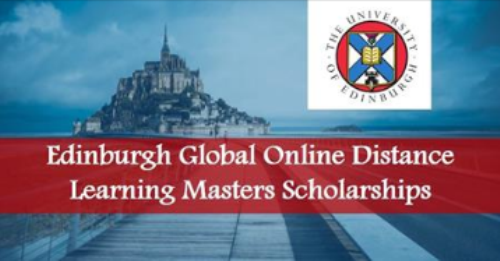 Now that all the information about Edinburgh Global Online Distance Learning Masters Scholarships has been delivered nicely; talented students who are eager to pursue their Free Tuition/Scholarships/Study in United Kingdom (UK) can apply now.